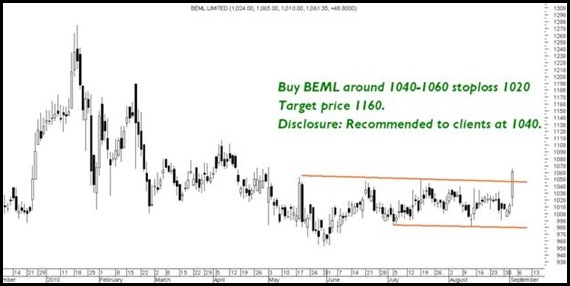 Strong breakout seen above 1040 levels The stock should move upto 1160 in extreme short term. Buy with a stoploss of 1020. Strong Breakout on weekly charts at 290 levels. Accumulate at 295-300 and on dips with a stoploss of 275. The stock should do a target of 335/400 in medium term. TECHNICAL ANALYSIS TRAINING SESSION MUMBAI SEPT 4-5 and SEPT 11-12. FOR MORE DETAILS GET IN TOUCH WITH KAZIM 09821237002 TO CONFIRM YOUR SEAT. at Finance and Investment Exhibition. 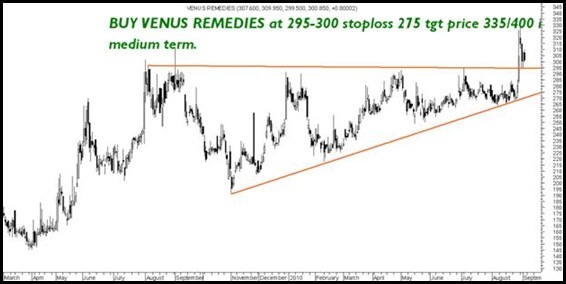 thanks for your updates…u rock man…again we have seen upward movement from 17800..
Surya Pharma one should wait but long term i maintain the positive view. See you Rocked…! and back in action !! 🙂 Rahul please dont discuss client calls in an open forum:). Sir need your comments on J&K Bank. Looks very interesting but need accumulation levels for it. Pls guide me. Sir pls reply my Query. U rock Nooresh.. BEML was gr8..
BEML – Waaw!!! This is what called as hitting the bulls’s eye.. Interesting analysis..
Thats Clean Simple Technical Analysis which we teach. Your calls have been spot on more often than not … Just wanted to thank you for your analysis ..
hesh here ur call rock BEML. i have time techno @ 55 as u give buy call what should i do? Also i hve old supreme petro. right now all time high. what to do? check fundamental ur side. i check technical no sign seen of tgt!!! GTL and RComm deal collapsed. What do you make out of it ? I think it is good for GTL infra as lot of debt would have added to its books. Please comments and let us know ur long term view on GTL infra. The things still remain good for GTL infra in long term but will wait n watch. IS IT BUY IN F&O, OR CASH ONLY ?